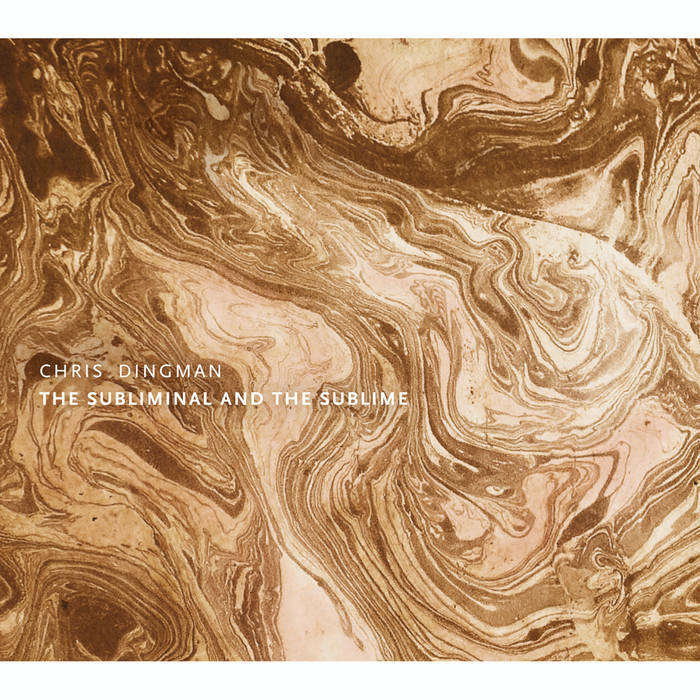 It's been a while since vibraphonist Chris Dingman's The Subliminal and the Sublime was first released in June of this year. I tweeted about the album when I first heard it back in May saying it was "a stunning aural feast." Despite having listened to probably a hundred albums since then, I felt compelled to come back and elaborate on this fine work. Mr. Dingman has been called a "dazzling" soloist by the New York Times and since his arrival to New York in 2007, he has collaborated with some of jazz's most cutting-edge musicians. He has been recognized as "an extremely gifted composer" in his own right. If music can paint a picture in your mind then certainly Mr. Dingman's vision is one that can be viscerally shared with little effort by simply immersing ourselves in this music. Having had the great fortune of being commissioned by Chamber Music America, Mr. Dingman based this work on the idea that in our everyday lives we experience subliminal patterns. Realization of those patterns can lead one to the sublime. To this end, Mr. Dingman and company created this five-movement piece of music. From his opening score titled "Tectonic Plates," with its transcendent sound of Tibetan singing bowls, you are transported. The bowls create the perfect sound representation of the glacially slow but constantly persistent movement of the Earth's lithosphere. Even if we can't necessarily feel it we know it is happening all around us. In this mostly through-composed work, Mr. Dingman is expressing his experiences -- experiences found in nature and in deep meditation. The ensemble he has chosen to work with on this album are all equally sensitive musicians that contribute their own sense of creativity to this music. Alto saxophonist Loren Stillman possess that cool, fluid sound that is so perfectly matched with Mr. Dingman's own musical identity. Pianist Fabian Almazan and guitarist Ryan Ferreira are equally adept at playing in a sensitive and moving way. Bassist Linda Oh and drummer Justin Brown play their respective roles with precision and poignancy. On "Voices of the Ancient," the sound of a processional chant creeps from Mr. Almazan's piano intro, Mr. Dingman's tubular vibes and accents of faint guitar chords from Mr. Ferreira. Mr. Stillman's sax enters as a luminous lead voice with Mr. Dingman's vibes and Mr. Almazan's piano dancing lightly behind him, punctuated by thunderous rolls from Mr. Brown, plump, bulbous notes from Ms. Oh and ever so faint sustained guitar cries from Mr. Ferreira. On the second movement of this piece, Mr. Ferreira's guitar opens like a lone distant voice in some hidden cave calling to us in repeated subdued refrains. Dare we enter? What will we find? Mr. Almazan and Mr. Dingman have an amazing affinity for producing complimentary sounds that create the illusion of trickling water deep within. Ms. Oh's sparse bass lines are like a throbbing planetary heartbeat. Mr. Brown's shimmering cymbals beckon. Mr. Dingman ultimately states the repeating refrain that is picked up by Ferreira's guitar, Stillman's saxophone and Dingman's own vibes in a celebratory declaration of discovery. This music has an uplifting quality to it. It portrays the beauty of nature as experienced by Mr. Dingman, with awe, respect, and unrestrained joy. From this strong resolution, the movement goes right into "The Plea," a short segue piece, with its subdued intro that seems to utilize some overdubs. Stillman's sax is the declarative voice that makes a moving plea of what seems to be simple gratitude with Dingman reaffirming this sentiment on his vibraphone. "The Pinnacles" returns with the distant sound of the Tibetan Bowls. Dingman sometimes bows his vibes with reverb producing an otherworldly sound that seems to hang in the air like a morning mist. If you have ever been on top of a mountain range and experienced the majesty that surrounds you, then you will understand what Mr. Dingman is trying to express. The piece slowly emerges from within as Mr. Stillman's saxophone voice is heard declaring itself amongst the peaks. The movement then becomes a pure expression of awe and appreciation. Mr. Dingman's vibes in concert with Mr. Stillman's saxophone, Mr. Almazan's piano and what sounds like vocal overdubs being the predominant vehicles of expression. They work in concert producing a beautiful harmony of sounds that erupts with joy. There are many parts to this journey. Mr. Brown's repeated bashing of cymbals declaring a somewhat brusque finish to one part of this movement, later yielding to Mr. Dingman's airy sounds on vibes finishing another. The final movement is titled "All Flows Forth" starts out with a rhythmic refrain that allows the piece to flow like a steady current. Mr. Stillman and Mr. Dingman have great rapport as they weave ideas together over the groups' steady accompaniment and Mr. Ferreira's repeating guitar pedal-point line. The combination of vibes, piano and guitar playing in concert has the sound of a be-jeweled music box. Over it all Mr. Stillman's icy saxophone pierces the magical cacophony they create like a clarion voice. Mr. Almazan has a chance to let loose in a rapid-fire display of keyboard wizardry complimented by Mr. Brown's explosive drums. I reiterate The Subliminal to the Sublime is an "aural feast" to be savored. If you have 60 minutes in your frantic life to dedicate to this music, sit down in your zero gravity recliner with a fine set of quality headphones and allow yourself to be immersed in Mr. Dingman's images. You will be renewed.